The unique whipped cream texture oxygenates, detoxifies, and reveals a healthy and lumped skin. Recommended for dull, greyish, asphyxiated complexions, individuals living in a polluted environment or smokers. After a serum, apply in light strokes to the face and neck without over-massaging. 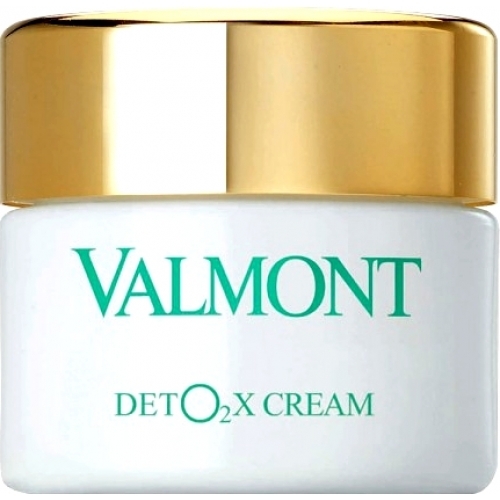 DETO2X Cream offers the skin a true breath of fresh air! Each day, the cream captures oxygen in the atmosphere and infuses it into the skin. That is why the cream features a foamy / whipped cream texture that is recreated each and every day. Every morning after applying a serum, skim off the foam at the surface of the cream, apply four dabs of cream on the face and rub in using light effleurage gestures. If possible, skim off and apply the cream using a brush. For a complete oxygenating program, apply Prime Regenera I at night. For optimal effectiveness and to maximize skin oxygenation: Do not heat the cream in your hands.